Tickets are now available for our annual Super Bowl Party! Tickets are $40 and include, exclusive lounge access starting at 3pm, food, drinks and 2 cigars. The cigars will be a Davidoff 702 Robusto and a NEW Release, the Wynwood Hill’s Mayhem from CLE Cigar Company. Tickets are limited to 25 seats, so get yours now and don’t miss out on this great party! We will also be offering some game day only specials on the Wynwood Hills! 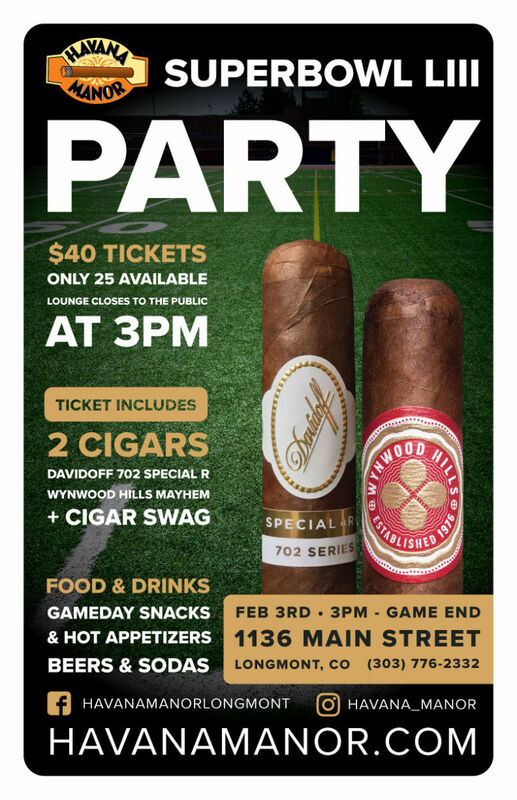 This entry was posted in Events and tagged Davidoff, super bowl, Wynwood Hills. Bookmark the permalink.